Wash, peel and chop the cucumber into pieces. In a saucepan, add the cucumber pieces, turmeric powder, red chilli powder and water and cook till almost done. Meanwhile, grind the coconut, cumin seeds, green chillies and some water into a smooth paste. Add the ground coconut mixture to the cucumber and mix well. Then add some water and salt to it and let it cook for 5 minutes. Now add the beaten curd and cook for a minute and switch off the flame. 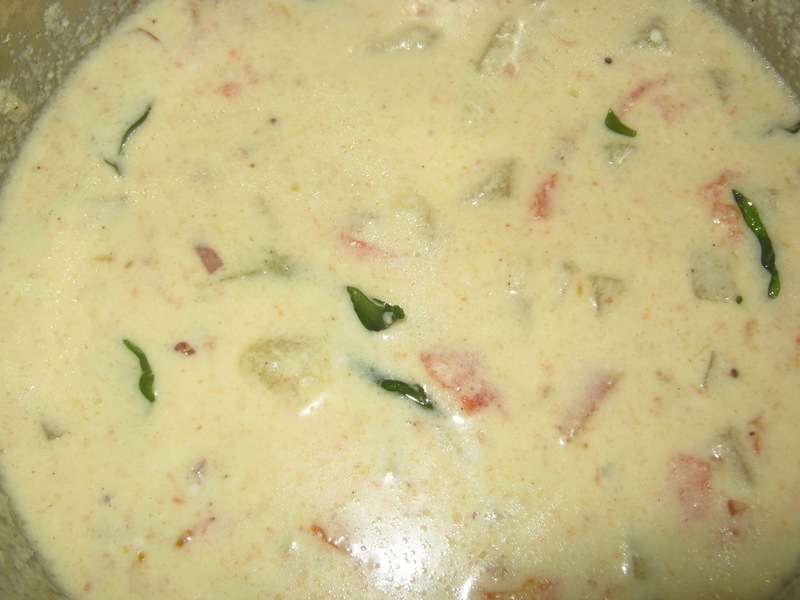 Heat a tablespoon of coconut oil and add the mustard seeds and fenugreek seeds and let them splutter. Now add the hing, curry leaves, finely chopped onion, chopped ginger and red chillies and fry until brown color. Switch off the flame and dunk everything into the gravy and mix well. Serve with rice.